The official weigh-ins for “WEC 52: Faber vs. Mizugaki” takes place today inside The Pearl at the Palms Casino Resort in Las Vegas, Nevada. Stream Wednesday’s weight contest live right here on 5thRound.com starting at 7PM ET/4PM PT. 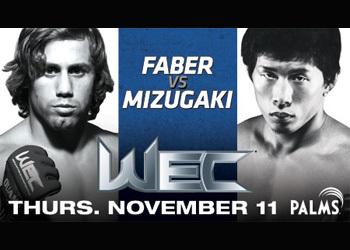 Thursday’s show features a bantamweight bout between former WEC featherweight king Urijah Faber and Takeya Mizugaki. Versus will air the WEC’s second-to-last promotion live at 9PM ET/6PM PT. Please click here for exclusive fight packages from The Palms.